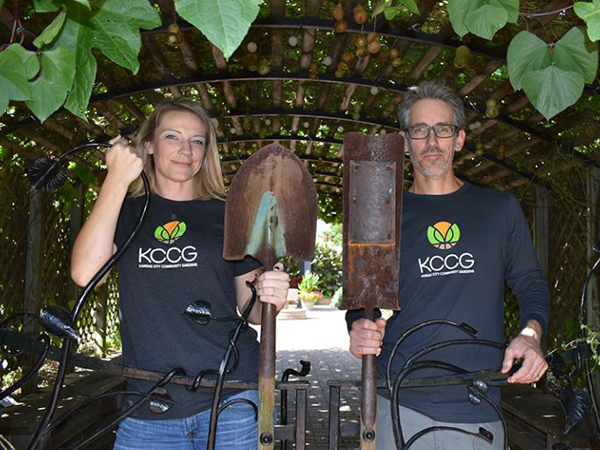 Kansas City Community Gardens strives to be your one stop shop for quality, low-cost gardening supplies. In addition to the seeds and plants that we offer, we also sell the following garden supplies. These supplies are currently for sale only at our Swope Park office (6917 Kensington, Kansas City, MO 64132). Availability varies with seasons and amount of demand. We recommend that you call KCCG offices to check availability. Heavy Duty fork for turning large garden plots. Turns a 20” area and has removable fiberglass handles. Great for turning over raised beds. Can be used for digging potatoes, carrots, beets, turnips, & onions. Great for turning over ground plots, strong enough to break up heavy clay soils, Use to loosen hard pan after tilling. Also use for digging potatoes, carrots, beets, turnips, onions. Sharp on three sides, 60 inch ash handle, Great for weeding, loosening soil, cultivating between rows, bed preparation, making furrows, & chasing opossums. Made out of concrete reinforcing mesh, these cages will support large tomato plants without bending or breaking. Must be staked. $5.00 per cage. Protect your plants in cool spring and fall temperatures. Our row cover is 7’ across and will provide up to 5 degrees of protection. $0.25 per linear foot. Straw is great for mulching your garden as it is inexpensive and can cover a large area. Limit 8 bales - Check back or call us for pricing. Add organic matter to your soil while suppressing weeds and insulating the soil. Cotton burr compost looks similar to wood mulch but is better for your garden's soil. $6.75 for 2 cubic foot bag. KCCG is now selling organic fertilizer in the form of pelletized chicken manure. This product is “Omri listed” for organic production. 5–3-2.5 guaranteed analysis. All quantities are self-service. – Use for cabbage worms, cabbage loopers, tomato worms and other caterpillars. - Use to control many different types of garden pests. Time between application and harvest varies by plant; check label for specific instructions.